The Family Educational Rights and Privacy Act of 1974 (FERPA) is a federal law which protects the privacy and confidentiality of student educational records. FERPA applies to all institutions that are the recipients of federal aid administered by the U.S. Department of Education. 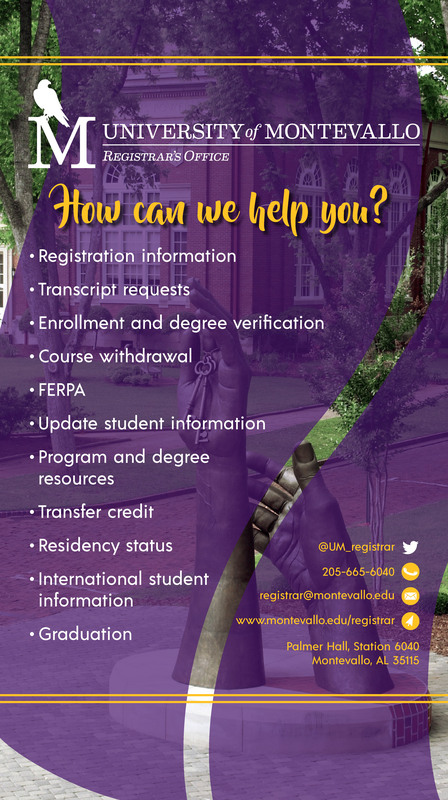 The University of Montevallo is committed to adhering to the requirements established under FERPA. A person becomes a student for purposes of FERPA when they are considered “in attendance” at an institution. Therefore, FERPA covers any current or former student that has been enrolled for at least the first day of classes for any term. Students that have been admitted but have never attended would not be covered under FERPA. With certain exceptions, an education record is any record (1) from which a student can be personally identified and (2) maintained by the University. Education records can exist in any media (handwritten, electronic, print, magnetic tape, film, etc.) that are in the possession of any school official. This includes transcripts or other records obtained from a school in which a student was previously enrolled. FERPA requires that institutions notify students of their rights under FERPA annually, which is communicated by the Registrar’s Office via a broadcast email. For more information concerning your rights under FERPA, visit Student Rights Under FERPA. An institution may disclose some information without prior written consent of the student to non-affiliated third parties if it has designated such information as “directory information.” A student has the right to prevent the disclosure of their directory information. For more information, visit Directory Information. When can personally identifiable information from a student’s educational record be disclosed without written consent? Can a student grant authorization for the release of information from their education record to parents or other individuals? Yes. Please refer to Record Release Authorization for more information.